Brian Davis Handsigned and Numbered Limited Edition Canvas Giclee :"Twin Beauties"
Edition: Artist signed and Numbered Limited Edition Giclee on Canvas to 95 with COA. 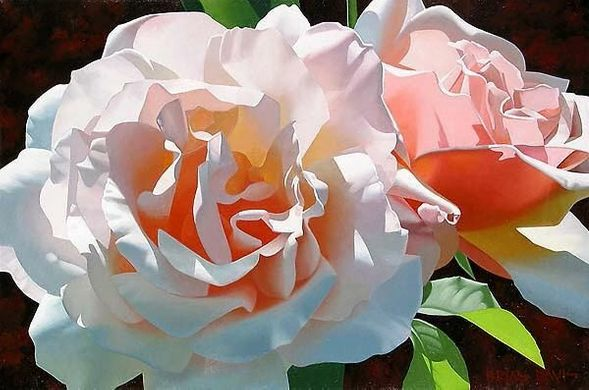 About the Artist: The old adage, "Art imitates life," could not be a more true description of how profound and true Brian Davis' work is.Known for his special attention to light and detail, Mr. Davis' primary subjects are florals and landscapes. Born in California in 1946, Brian Davis was raised by musician parents to appreciate all things artistic and, staying true to his upbringing, has always loved painting. Art is his passion. It is the muse with which he creates his colorful true to life florals. Although magnificent flowers and landscapes are the main choice for his compositions, Mr. Davis explains, "The actual job of making an arresting piece of art has nothing to do with what the thing is. "He transforms exquisite roses, calla lilies, and dahlias into romantic, compelling images with sharpness, color, movement, edge and light. Before he begins his masterpieces, Mr. Davis spends extensive time researching and scouting for a flower or scene that catches his eye. He carries a camera everywhere so he can shoot a subject at any moment. Since flowers wilt so quickly, and it can take weeks to complete a painting, he has found a way to create a floral image from a series of different shots for each flower. Therefore, he does not do an exact botanical rendering, but alters colors and leaves at will. Mr. Davis believes that the depth of his art is derived from paying attention to the subtle shifts in value - relative dark and light. He is often asked if there is a light source behind his paintings, to which he responds, "The light is the real subject of my work. The flower is the stage, the light is the dancer." Using two hanging mirrors to view the unfinished painting at all angles, he works daily in his studio surrounded by books, music, and historical videos. Mr. Davis is a true artist with vast understanding and knowledge of art. "My art, like all art, is at its core a form of communication that is not easily translated into words - good art transcends words." It is his hope that viewers look at his works and respond, for then they are hearing his voice, understanding his concept of what is worth creating. His paintings are a fascinating group of images that allow the viewer to feel and recognize the nature of light - the essence of a Brian Davis painting. One of the greatest achievements in Mr. Davis' career has been his commissioned work for The Huntington Library Art Collections and Botanical Gardens.Over the last 20 years, the floral painting expert has created seven pieces that have been used as posters to commemorate different exhibitions at The Huntington.His seventh piece, "Captivating Cattleya" was most recently used in October 2005 for the "Orchids: A Natural Obsession" exhibit. Mr. Davis' work can be found in the permanent collection of The Huntington Library, The Los Angeles County Museum of Art, and the New York Botanical Garden.